Where There is a Space, There is Opportunity for Adaptable Perfection! 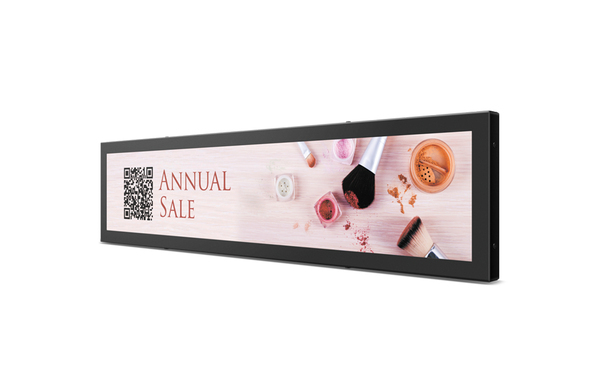 BenQ's BH281 is a long-structure bar-type display specially designed to suit your unique spatial 28" stretched screen, the BH281 can be seamlessly integrated into small and narrow spaces, displaying important information right beside your products. Whether showing messages on luxury boutique counters or supermarket shelves, the BH281 also features internal speakers and USB plug-and-play support, so you can deliver audiovisual messages in compact spaces with minimal installation. Unlike anything else available on the market, BenQ's bar-type displays are built to ensure a flawless portrait view. With a structural design that employs abundant solid fixing points on every edge, we are able to prevent "mura" image distortion that is commonly seen on vertically positioned consumer displays. A 60,000-hour lifespan translates to years of non-stop display service and reliable, economical industrial-class performance that surpass consumer needs. Fully compatible with BH281, X-Sign software can help you customize, edit, manage and play content you wish to showcase, allowing you to instantaneously engage customers. 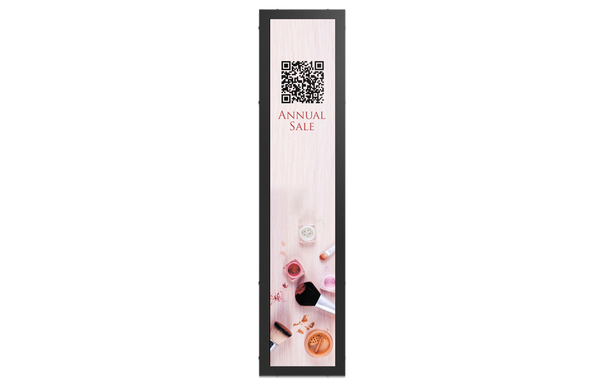 • Choose from multiple templates that support image and text animation, video and playback, QR code implementation and daily scheduled playlists to create in-store display content. • Display content easily through a USB flash drive or BenQ's double service. • Manage and distribute content for single or multiple displays via the internet to save time, costs and effort. At 1,000 nits, the BH281 can deliver superior brightness for striking colors and clarity even in spaces with ample ambient light. This gives you greate freedom to use the BH281 for a wide range of indoor and semi-outdoor applications without sacrificing visibility and legibility. The BH281 comes equipped with two 2W speakers, so audio can be freely incorporated into promotional content and engage customers like never before. The BH281's plug-and-play simplicity enables you to access and play multimedia files directly from a USB flash drive. Requiring no PC connection or complicated cable setup, the BH281 ensures a holistic shopping experience with the most hassle-free installation. With special proportional sizes engineered with elegant unibody design, the BH281 can cater to the unique spatial demands of public transit systems, store shelves, elevators, bank interior display monitors, or any display area that calls for long and narrow designs.